The area is a popular tourist, weekend and vacation destination and claims a connection to a couple of famous movies. Lake Lure was the setting used in Dirty Dancing and Chimney Rock was the backdrop for The Last of the Mohicans. 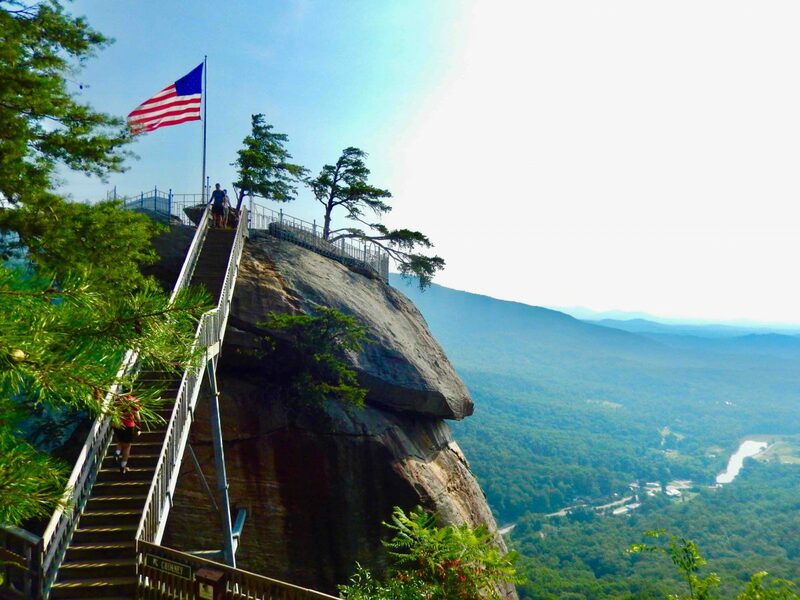 While the area has all the trappings of a tourist town the trails and views surrounding Chimney Rock are also really amazing. If you love the mountains and like to hike this is worth a two or three day visit. If you are looking for a good B&B you should check out our review of The Broad River Inn located in Chimney Rock. During a short visit to Copenhagen, Denmark a group of our friends went off to see the changing of the guard at Amalienborg Palace. We had plans to find the little mermaid and stroll the canal district. Sometime a little after eleven we were window shopping along Dronningens Tvaergade when flashing police lights caught our attention. 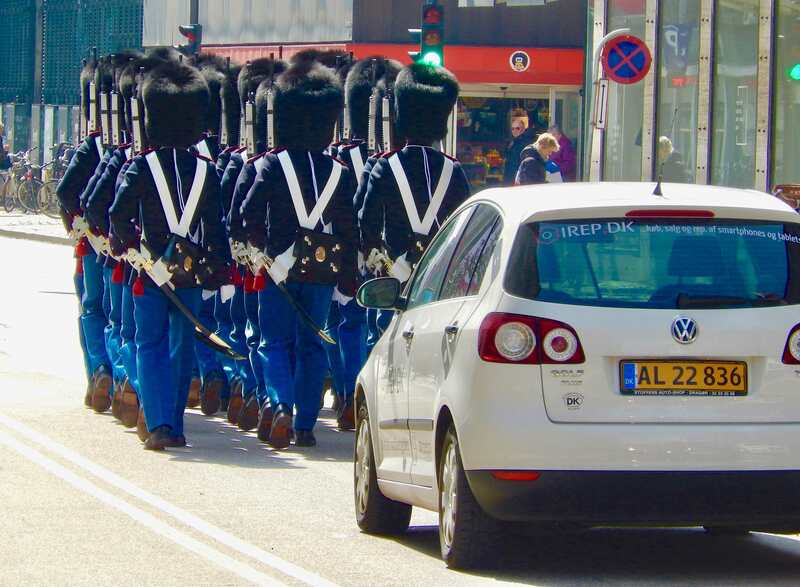 Walking down to the corner we were surprised to see the Danish Royal Guard marching down the center of the street led by a police car. Traffic was backed up behind them and crowds followed down the sidewalk. They came to our position just as the traffic light turned red and they halted. Once the light turned green their commander gave the order to march and they moved off. It seems the Danish Royal Guard march from Rosenborg Castle to Amalienborg Palace where the Changing of the Guard ceremony takes place daily. The guard leaves Rosenborg Castle at 11:30 am to arrive at Amalienborg Palace for the ceremony at 12:00. When the Queen is in residence the guard is accompanied by the Royal Guards music band. Some time ago we were visiting England and had rented a car for a few days driving around the Cotswalds. The countryside and the villages were spectacular and we had a great time. Our two favorite locations were Broadway and Stow-On-The-Wald. Who wouldn’t want to stay in Stow-On-The-Wald just to be able to say the name. While The Lygon Arms in Broadway was recommended to us it was not to our budgets liking but we’ve been told it is extraordinary. We had been staying in Kensington and when we returned we went searching for a hotel in the same area. At that point my wife was really looking to have a room with a private bath. I parked in one of those cul-de-sacs that was completely circled by small hotels and headed off in search of a room. The forth hotel said “yes” they did have a room with a bath. We dropped our bags off in the lobby and went off to return the rental car and get something to eat. When we returned the hotel said the room was ready and we went upstairs. Opening the door we were confronted with a small room with a bed, a dresser and in one corner a clawfoot tub. That night my wife got her room with a bath but I wouldn’t refer to it as “private”.